Dubai, United Arab Emirates: ME NewsWire: Millennium Place JVT Dubai, one of the latest hotel projects from leading Dubai-based property developer The First Group, has received a Highly Commended Award in the Best New Hotel Design & Construction category at the 2016-17 Africa & Arabia Property Awards. The property eclipsed a host of high-profile rivals to receive the honour, which was judged by an esteemed panel of more than 70 internationally recognised architectural and design experts. The objective of the awards is to acknowledge excellence in the property industry worldwide and to promote the highest international standards for construction and design. The striking 34-storey glass-clad Millennium Place JVT Dubai, which is scheduled to open in 2019 and will be managed by Millennium Hotels & Resorts, is The First Group’s fourth hotel property currently under development in Dubai, with other projects located in Dubai Marina, Business Bay and Jumeirah Village Circle (JVC). The First Group’s hotel portfolio also includes the prestigious Wyndham Dubai Marina, which is managed by the world’s largest hotel operator, Wyndham Hotels Group. The awards recognition follows the recent appointment of Indian Test cricket legend Sunil Gavaskar as The First Group’s newest ambassador. Gavaskar, who is widely recognised as one of the greatest opening batsmen in cricket history, is also an investor in Millennium Place JVT Dubai. The 599-room hotel will be situated in a prime location in the heart of one of Dubai’s most sought-after commercial and residential communities, close to several major landmarks and attractions. 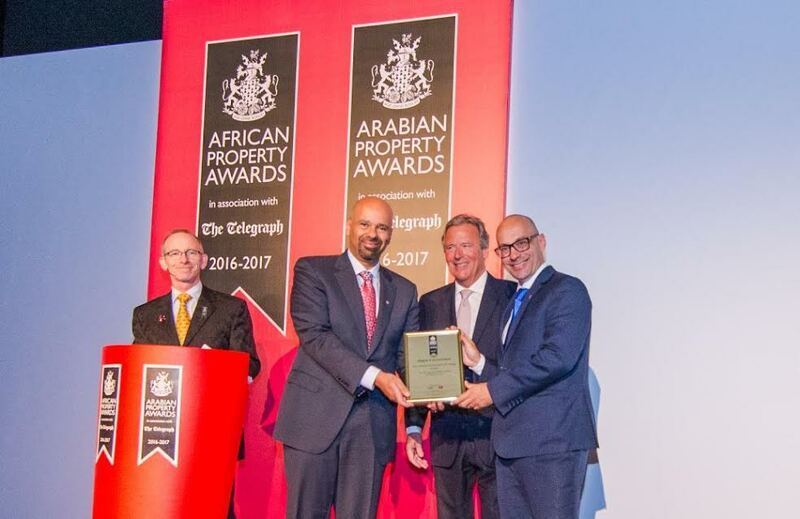 The First Group was officially presented with the award at a gala dinner presentation held in conjunction with the IPAX Africa & Arabia exhibition in Dubai on 22nd September. Commenting on the win, Danny Lubert, The First Group co-founder and joint chairman, said: “It is a great honour to receive this recognition on behalf of everyone involved in the development of Millennium Place JVT Dubai, which is set to raise the bar for hospitality standards in the thriving district of Jumeirah Village Circle. A striking 34 storey glass-clad building with a sizeable inventory of 599 guest rooms, Millennium Place JVT Dubai will set new hospitality standards in the up and coming district of Jumeirah Village Triangle. Boasting a prime location, the hotel’s is situated close to several major landmarks and attractions, including the upcoming World Expo 2020 site in Dubai South, and Dubai’s new mega aviation hub, Al Maktoum International Airport. Millennium Place JVT Dubai has been designed with business and leisure guests in mind, with stand-out facilities including two specialty restaurants, a spa, business centre, and a luxurious rooftop clubhouse with swimming pool, gym, steam rooms and a sundeck. The hotel will also offer a suite of services including valet parking, concierge, 24-hour room service, laundry and dry cleaning, a travel booking desk, Wi-Fi and broadband access and a smart-card access system. The First Group is a British-owned international hotel & property development company, whose principals have built up their expertise and success in the global market over the last 30 years. The First Group management team draws from strong and diverse backgrounds in the fields of global property, finance, acquisition, marketing and product development. Its expert eye for emerging property market potential and prestigious partnerships with industry leaders means that their clients can enjoy secure and attractive returns from one of the world’s most vibrant hotel markets. With its global headquarters in Dubai and offices spanning Algeria, Azerbaijan, Ghana, India, Kazakhstan, Nigeria, Oman, Russia, Saudi Arabia and Turkey, The First Group’s client base is expanding rapidly.